How Does a Calorimetry Work? A calorimeter (below) is a device which can measure the amount of heat generated during a chemical or thermal reaction, usually through an indirect method of measuring heat transfer. An object such as piece of metal is heated and its initial temperature and mass are taken. The object is then placed in a given amount of water (whose initial temperature and mass are also taken). The transfer of heat as noted by changing temperature is monitored using the thermometer. As the metal cools and its temperature drops, the water warms and its temperature–indicated by the thermometer–increases. The flow of heat continues until we reach thermal equilibrium, or the temperature of the water and metal are the same. Once that occurs, there is more transfer of heat and so the final temperatures of the water and metal are considered to be the same. Since the mass of water and its specific heat (a standard value) are known, then the temperature changes can be used to calculate the specific heat of the metal since its mass is known. So basically, how much energy did it take to transfer the heat from the metal with “x” specifications to water with “y” specifications? 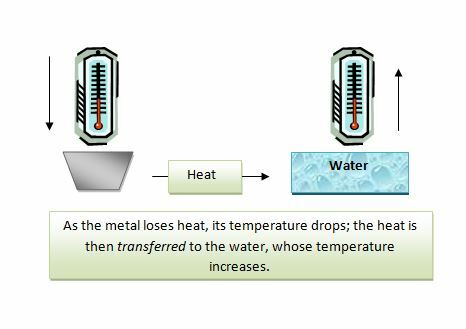 NOTE: the amount of heat the water GAINED and the metal LOST are EQUAL. Therefore the quantity of heat is the SAME amount but the signs for heat are opposing. A piece of metal weighing 7.8 g at a temperature of 50.5◦C was placed in a calorimeter into 60 ml of water at 20 ◦C. The final equilibrium temperature was 30 ◦C. What is the specific heat of the metal? Step 2: Plug values into the corresponding parts of equation and solve for the unknown, in this case the specific heat of the metal.